BetterTouchTool は、Magic Mouse、Macbook トラックパッド、Magic Trackpad のための多くのジェスチャーを設定することを可能にする素晴らしい、機能満載の無料アプリです。また、キーボードショートカット、通常のマウス、および Apple Remote のアクションを設定することもできます。これに加えて、iOS 対応の App（BTT Remote）もあり、あなたの Mac をあなたのやり方で制御するように設定することもできます. 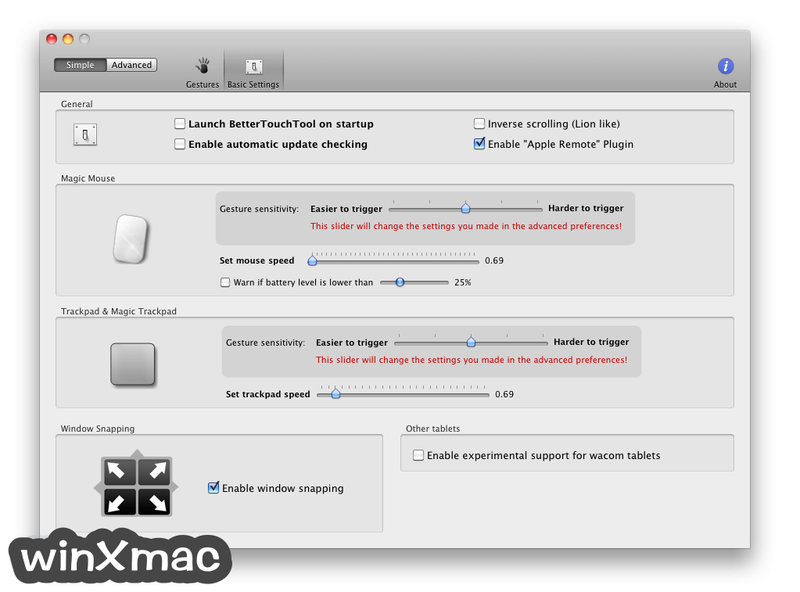 BetterTouchTool for Mac は、あなたの Mac（Mac OS X 10.7 以降を実行中）用の（絶対に無料の）ソフトウェアです。これには数多くの機能があり、Mac. - Added a "visible checkbox" to the Touch Bar tab. This allows you to temporarily disable/hide Touch Bar items. It also allows you to hide Touch Bar Groups that you only want to open using the predefined action "Open Touch Bar Group"
- More preparations for the launch of the "preset sharing platform"
- Other Triggers: You can now specify "named triggers" in the other tab in BetterTouchTool. These can be triggered using the predefined action "Trigger Named Trigger"
- Predefined actions: Added predefined action "quit application under cursor"
- Predefined actions: Fixed issue with "Show Menubar in Context Menu"
- Vastly improved "Move Mouse To Position" action. It can now move the mouse cursor relative to either the current mouse cursor position or relative to the corners of an active window or to the currently focused UI element or to the current text cursor position or to a window's cancel or default button. This allows you to create actions that e.g. click specific elements in a window. - Added predefined actions "move window to desktop 1-16", "move to desktop 1-16"
- Fixed predefined action "Toggle Do Not Distrub"
- Added predefined actions "move window to desktop 1-9", "move to desktop 1-9"
- BetterTouchTool now auto-detects when macOS Secure Input is active and changes the shortcut handling to continue working in "limited mode"
- Keyboard shortcuts can now differentiate between left modifier keys and right modifier keys (e.g. left cmd and right cmd). To enable this functionality click the little cog icon left to the shortcut recording field. - Added a new Touch Bar Widget "Run Shell Script and Show Return Value". In many scenarios this will be much more performant than the Apple Script widget as it can run multiple scripts/tasks/commnands in parallel. It can be combined with the new predefined action "Execute Shell Script / Task". - Added a customizable Apple Script Slider Widget for Touch Bar. - Added predefined action "Open Touch Bar Group With Name"
- Added option to Touch Bar settings to choose whether icons will be scaled keeping the original ratio or not. - Removed Leap Motion support for now (it wasn't working anymore anyways and I need to focus on the more popular parts in BTT). Maybe this will come back with future versions. If you still rely on it, please don't update to this version. - Removed experimental Wacom tablet support due to issues on High Sierra. This will come back with a future update. - If drawing gestures are defined per application but not globally, the feature will be completely disabled unless that app is active. - Added new trigger to "Other" section: After Launching on Mac with Serial Number". This let's you e.g. switch presets specific to a machine after starting BTT on that machine. - Added advanced setting to keyboard shortcuts "Prevent recursive triggers". This should prevent BTT from triggering itself by a action sent with BTT. 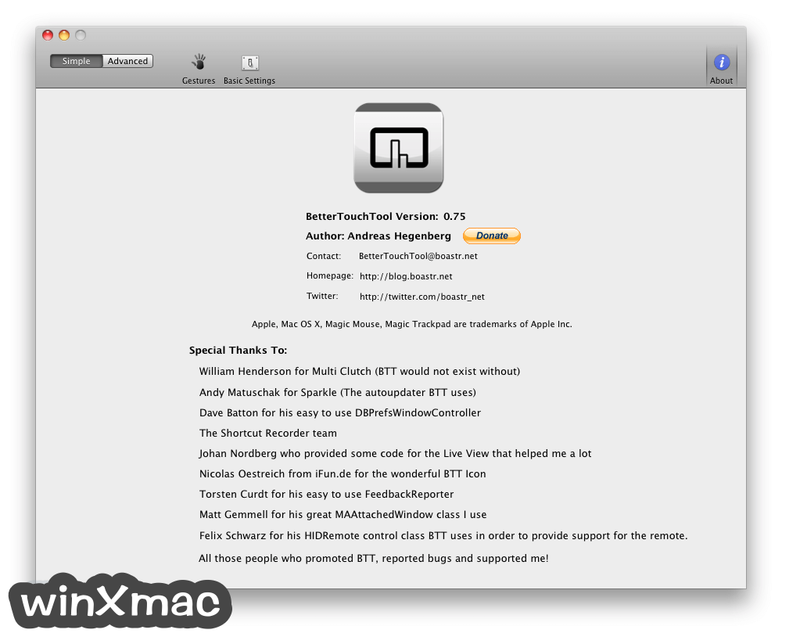 - Added new trigger to "Other" section: After Launching on Mac with Serial Number". This let's you e.g. switch presets specific to a machine after starting BTT. - Added Predefined Action "Activate/Bring to Front Window Under Cursor"
- Complete rewrite of the "Show Clipboard/Pasteboard History" action. Should be much more performant and powerful now. - Added a great new predefined action: "Show Clipboard/Pasteboard History". Basically it keeps a history of your clipboard and allows you to access it at any time. If you haven't used another clipboard management tool yet I highly recommend to try this, it has really improved my efficiency by a lot. It's probably not as powerful as other specialized clipboard management tools out there, but it has some features I was missing with other tools. - Improved the "Show Clipboard/Pasteboard History" action. I think it's now pretty cool. Feature requests very welcome. Unfortunately I had to change the data format of the clipboard history, thus the previous history won't be available after installing this update. - This is internally a very big update. It completely changes the BetterTouchTool data model in order to support syncing to multiple machines (e.g. via Dropbox). The sync functionality is not yet enabled in this version, but will be very soon if everything goes well. 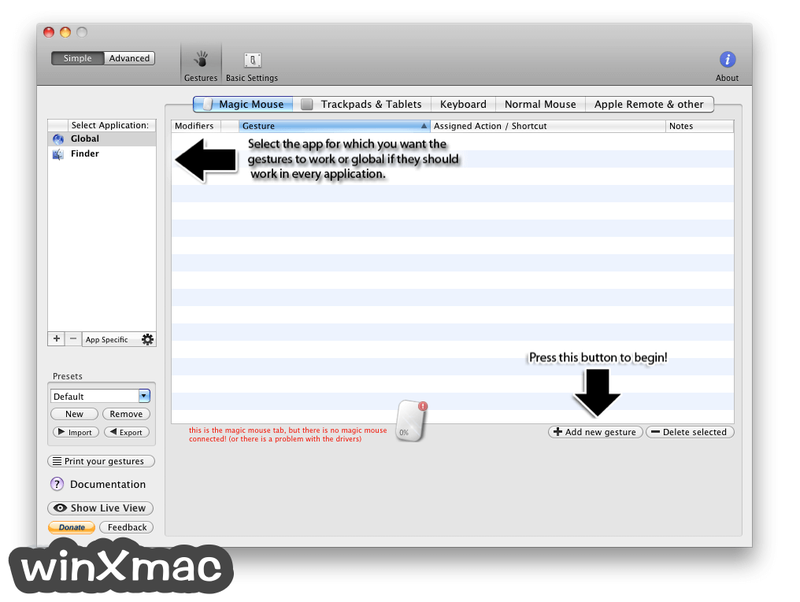 - This version migrates your previous BetterTouchTool data file to the new format, you shouldn't notice this migration. - In case anything goes wrong during the data migration: don't worry. BTT automatically creates backups. Please contact me in case anything goes wrong (best via Github). - Added predefined action "Volume Up (Small Step)" and "Volume Down (Small Step)"
- Added predefined action "Toggle Dark Mode"
- Added predefined action "Toggle Do Not Disturb On/Off"
- Added predefined action "Toggle Night Shift (experimental, requires macOS 10.12.4)"
- Added predefined action "Add New Space To Mission Control"
- Added predefined action "Run Apple Script in background"
- Added a new mode for pasting/inserting custom text. You can now choose between "pasting" and "typing", depending on the use case one might be faster than the other. - The Touch Bar brightness slider uses a different API and shouldn't be dimmed back by the system anymore. - The Apple Script widget now allows to run Apple Scripts which only update the widget by pressing it. To achieve this, assign the "Run Apple Script (enter directly as text)" predefined action. (You can leave the script field in the widget settings empty if you don't need timer based updates). - You can now set a minimum movement that is required before starting to recognize right-click drawings. - Drawing gestures should now only be recognized while being drawn with approximately the rotation they were recorded with (can be changed in the advanced settings). - Fixed various bugs with the drawings feature UI. - Signed with a new Apple Developer certificate because my old one has expired recently. - Custom drawing gestures can now be drawn by holding down the right mouse button (or two fingers on a trackpad). This currently only works on Sierra. Note: Straight lines are currently not supported by the algorithm used, currently your drawings need to include at least one curve or corner. - Added new predefined action to toggle hide/show a specific application. The predefined action is called "Show/Hide Specific Application"
- Improved drag to top Mission Control delay (while maximizing windows, it often happened that Mission Control showed up. It now requires more "force" to bring up Mission Control.). This can be disabled in Adanvced Settings =>Window Snapping => "El capitan: Delay Mission Control on top edge"
- This update adds compatibility with the new macOS 10.12 Sierra which will be released on tuesday. - Added usage view to the preferences window, which lets you visualize your BetterTouchTool usage (this will be improved over time).